Brownlow: Can Brodie or Steele win it? 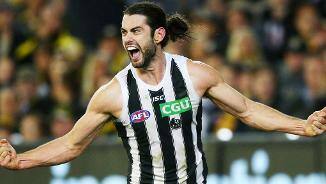 Collingwood should have plenty of players polling big votes in Monday night’s Brownlow Medal count, and Brodie Grundy and Steele Sidebottom are likely to be among them. Collingwood captain Scott Pendlebury says the club will rally around veteran Travis Varcoe, after the passing of his sister last Tuesday. Brodie Grundy has credited visualisation techniques as a key factor in his emergence as a star of the competition. A ruckman who imposes himself on games with his physical presence, Grundy excels in directing the ball at stoppages and can be a dangerous marking target up forward. He should be praised for the way he handled the No. 1 ruck role during the tail end of his debut season, keeping Darren Jolly out of the side and improving with each passing week. He has a wonderful leap and a fierce drive to improve with each week. Despite strong competition from fellow ruckman Jarrod Witts, Grundy held down the starting ruck role for the majority of the 2015 season, a role which was solidified in a break-out 2016 campaign. Now considered one of the best young rucks in the league, the sky is the limit for the charismatic South Australian. Another fine season that saw Grundy continue his rise towards the game’s elite. Remarkably durable, the 23-year-old has not missed any football due to injury for more than two years. It’s an attribute that certainly helped Collingwood, for he shouldered the ruck burden solo for much of the year. He averaged 18 disposals and a career-high 35 hitouts per game, earning Brownlow Medal votes against St Kilda and Melbourne along the way. The votes against the Demons were based on a 53-hitout performance, one that was complemented with 11 tackles. Grundy finished the season strongly, averaging 41 hitouts between rounds 17 and 19. Unfortunately, suspension for an unintentionally illegal tackle against North Melbourne saw him sit out two games. He returned for the final round against Melbourne and impressed greatly as a forward, taking an equal season-high eight marks. The South Australian was considered unlucky to miss the 40-man All-Australian squad, but signed a three-year contract extension in August. He shapes as a key part of the foundations of future Collingwood success. He started the year in the VFL. He finished it with murmurs of All-Australian selection. 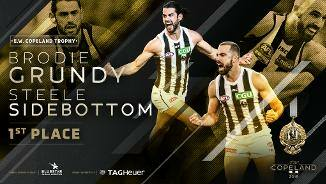 It has been a whirlwind year in the life of Brodie Grundy, who evolved into one of the competition’s premier ruckmen. After falling behind in the late stages of the pre-season due to injury, Grundy found himself beginning the season in a VFL Magpies practice match, rather than in Sydney with his AFL teammates. However, an injury to Jarrod Witts opened the door for his return to the senior side in round two and he never looked back. It took just four quarters for Grundy to emphatically stamp his foot on the season. Already with 16 disposals and a goal against Richmond in round two, he opportunistically grabbed a ball late in the game and threw it on his boot towards goal. Cue MCG pandemonium. The siren sounded seconds later as the ruckman was left the hero and the Magpies’ one-point victors. Consistency aided Grundy’s mission to have a breakout season. After never playing more than 10 consecutive AFL games in his first three seasons, the South Australian didn’t miss a game between rounds two and 23. It all began to click after the mid-season break, when he averaged 20.1 disposals and 31.3 hitouts. A clash with GWS Giants’ powerhouse Shane Mumford was a highlight in round 16, as Grundy won three Brownlow votes for the first time in his career. Another three came the following week as the 22-year-old went from fringe ruckman to one of the best big men in the game. 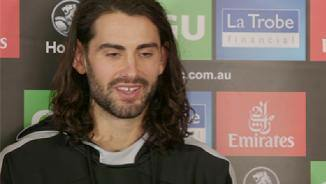 Grundy entered the third season of his career with the weight of Collingwood’s ruck hopes on his shoulders. While the task was slightly lessened by the presence of partner-in-crime Jarrod Witts, it was eventually established that the 21-year-old South Australian would be the Magpies' leading ruckman in 2015. The responsibility failed to phase Grundy, who averaged an impressive 29.5 hit outs per game in the opening month of the season. In round six he was joined by Witts and together the pair dominated Geelong’s duo of Rhys Stanley and Mark Blicavs. With the season seemingly going to plan, Grundy became the centre of dramatic scenes in June when he was placed in a neck brace and taken from the Holden Centre in an ambulance after an unfortunate training injury. He spent the night in hospital before facing an extended period of time on the sidelines. 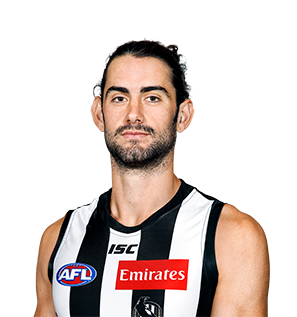 “I don’t have any pain, I just have a bit of soreness around my neck but besides that I am able to do anything that doesn’t aggravate my neck,” Grundy told Collingwood Media upon return to the club. After a month of recovery, the sight of Grundy in a Collingwood VFL jumper provided relief to fans at Victoria Park as the 203cm ruckman returned against Sandringham. He had 24 hit outs to go with 19 disposals in an impressive display which proved his fitness ahead of a trip home to South Australia to take on Port Adelaide. From this 15 match onwards, Grundy maintained his place in a Collingwood side which fell from finals contention. He had a career-high 37 hit outs against Carlton in round 19, before following it up with a more rounded effort against Sydney which produced 20 disposals and five tackles. Now sitting on a career total of 41 games, Grundy completed arguably the best season of his career in 2015. He achieved career-high averages in kicks, marks, disposals, goals, hit outs and tackles and played more games than he has in any previous year. Such were the wraps on Grundy as he entered his second season in the big league that many punters almost forgot he was just a teenager with only seven games to his name. The South Australian made his presence felt during the NAB Challenge with his aggression noted by opponents and umpires alike. He rucked in tandem with Jarrod Witts for much of the first half of the year, opening with 13 hitouts and nine tackles in the heavy loss to Fremantle at Etihad Stadium. He clearly benefited from the experience, winning 30 hitouts and laying five tackles in his next appearance against Sydney a fortnight later. Substituted out of the round four clash with Richmond early in the third quarter, Grundy put in arguably his best performance of the season a week later, recording 25 hitouts, laying six tackles and kicking the sealer against Essendon on ANZAC Day. Grundy’s goal was particularly memorable, as he roosted the ball from a good 50 metres out on the MCC Members flank. As the season reached its midway point, coach Nathan Buckley began to use Grundy as a key forward by way of taking the pressure off Travis Cloke. He took a career-high eight marks against Melbourne on the Queen’s Birthday but was unable to convert, kicking two behinds from 16 disposals. He returned to the VFL for his first match in almost twelve months when the Magpies met Footscray at Victoria Park in round 11. Grundy played six of his next seven games in the state league, averaging 31.5 hitouts and 17.5 disposals. His spell in the VFL was most notable for his 47 hitouts against Werribee in round 14. Four weeks later, after recording 24 disposals, 10 clearances and 30 hitouts against Essendon, Grundy was recalled to the senior side for the clash with Brisbane in round 21. He remained in the seniors for the remainder of the year, winning 23 hitouts against Greater Western Sydney’s Shane Mumford in round 22, before being substituted out of the loss to Hawthorn at half time. Grundy arrived at the club as one of its most precocious recruits for at least a decade but it took him several months to overcome the back injury that plagued him during the pre-season. The club took a softly-softly approach to his rehabilitation and introduced him into the VFL against Essendon at Victoria Park in round seven. He made a quiet start, winning seven hitouts and seven disposals as well as kicking two behinds in a narrow win. His basketball nous came to the fore in the final quarter of the win over the Northern Blues seven days later and by his third game against the Casey Scorpions he had well and truly acclimatised to life in the VFL. He won 22 hitouts and made his presence felt with his physicality. Three weeks later, Grundy showcased his unique talents at Box Hill City Oval, gathering 24 possessions, winning 39 hitouts, winning six clearances and laying six tackles. He also kicked two of the best goals of the day and after another strong showing against the Cats at Kardinia Park, the match committee could wait no longer. Grundy made his AFL debut in the No. 35 against Greater Western Sydney in a twilight fixture at the MCG and put in an accomplished 14 touch, 12 hitout, seven possession performance. He made rapid improvement as the weeks passed and was playing well enough to keep dual premiership ruckman Darren Jolly out of the side. Grundy’s best performance at senior level came in the loss to Hawthorn in round 20 when he had 20 possessions, 28 hitouts and six clearances. He rucked solo against Port Adelaide in the Elimination Final and while he had only six possessions, he managed to win 25 hitouts and four tackles. The physically advanced young ruckman played seniors for Sturt in the SANFL last year and was highly touted heading into the draft, despite the fact he only switched from basketball to football ahead of the under-16 championships last year. Has impressive mobility and skills for his size and ranked equal fifth in the Draft Combine clean hands test.